Fumbling Toward Family: Happy Birthday, Rowan! Leave it to a 3-year-old to make the best of a bad situation. Rowan spent his birthday weekend with the stomach flu. We had thought he might be feeling better by today, but the virus just made its way down the digestive tract (if you know what I mean). This morning, Rowan woke up feeling sick to his stomach and asked in a groggy little voice, "Is today my birthday?" I told him that it was, but I also promised that we'd have a super fun birthday do-over as soon as he was feeling better. By this evening, Rowan was feeling a little more playful. He even let me take a few pictures of him in his mismatched PJs (we've been doing A LOT of laundry). Rowan wasn't nearly as perky yesterday. 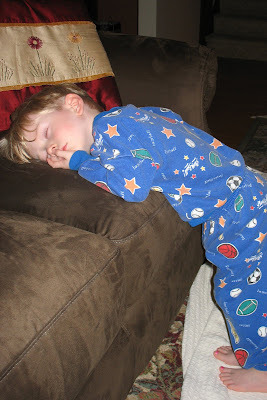 In fact, he was so tired by naptime that he fell asleep standing up! Happy birthday, my sweet little man! I'm so sorry that you had to be sick on your special day. Daddy and I will make it up to you as soon as you're feeling better. We love you! opxciWe love you so much Rowan and are so sorry you had to be sick on your birthday! We have been thinking of you all weekend and can't wait until we can celebrate!! Much love to you always! We are not sure why the word code printed on our message but it could be operator error! Poor Rowan. hope he feels like his old self again real soon. So sorry you were sick on your birthday, Rowan! Now you have something to look forward to again instead of it being over already!